On the Hunt for Classroom Books! What a weekend!! It’s hard to know where to begin, but I guess the most logical beginning is what we did on Saturday. Yesterday, we decided to go garage sale-ing (or sailing, whichever you prefer). My parents came with me and we printed off our city’s list of documented garage sales in the area. I brought my trusty red felt-tip pen (LOVE) and my iPhone with a wonderful Maps app, and we were off at about 9AM! We obviously stopped for Sonic drinks to make it through the long day of garage sales. Obviously. I withdrew about $40 in cash just in case. 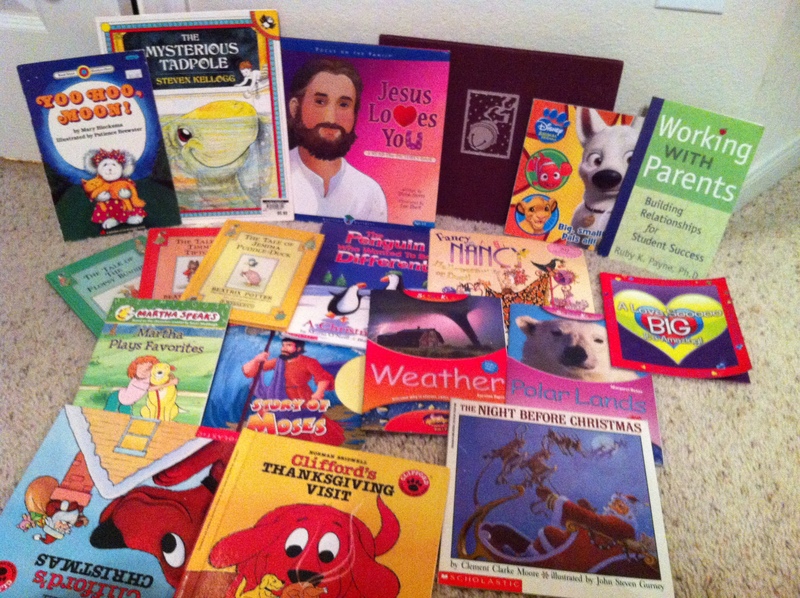 We hit around 20 homes in search of cheap children’s books. Some homes had them and others didn’t. That’s the fun of it. We saw some precious little ones selling lemonade, and one little girl who proclaimed, “I’m in kindergarten now and I will be going to 1st grade! I’m SCARED!” We had a blast. There was even one home that was an estate sale, and my mom bought a brand new golf set (for lefties) for only $40! Mind-blowing! I’m going to show you all the books I got first, and then I’ll tell you how much I spent. Okay? I got 20 BOOKS! For around $5.50! There was one sale where each book was 25 cents, but everything at their sale was 50% off the original sale price! What a deal. This was the same sale where I got the book The Polar Express, which was originally $18 hardback copy! I love garage sales. We’re going again at the first of June because that’s about the time when teachers are done with their school year. I can hardly wait to see what I find. Today, I went to church, and saw something special waiting for me. 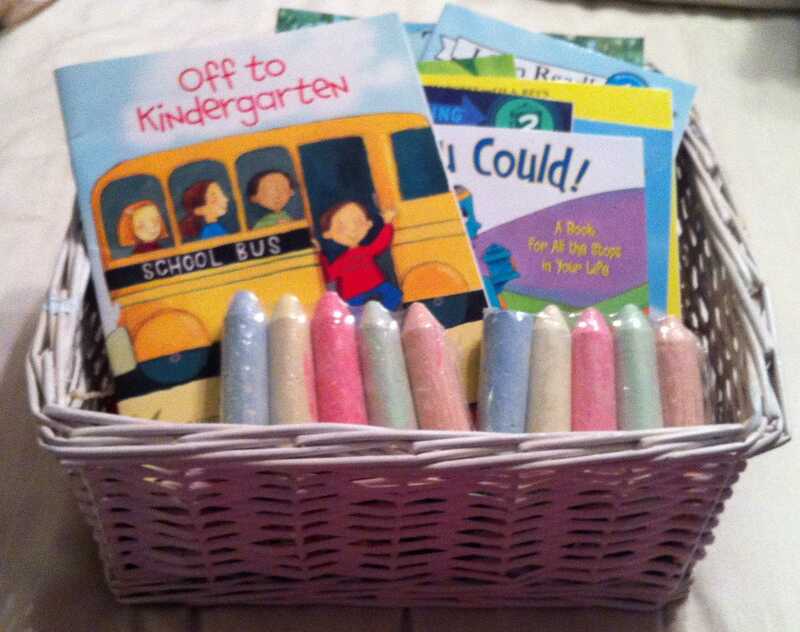 I received a basket of books from my Secret Pal/Sister from church for my graduation gift! Isn’t that sweet? She even got me some sidewalk chalk. Here are the two pictures of that. I love new books. I can’t wait to use all these in my class! I’ll post more as I get more. I’m going to be making a teacher binder soon, so keep an eye out for that. I really haven’t been doing much else. 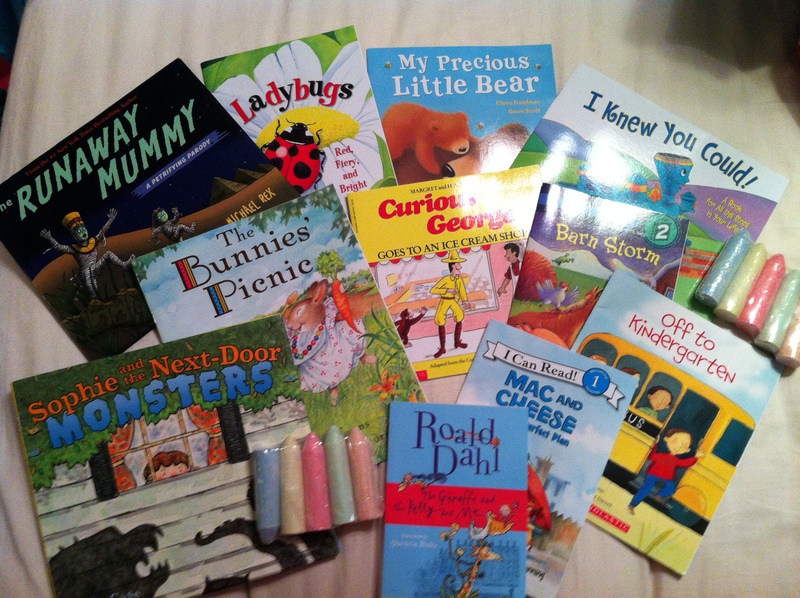 Which books do you like best for kindergarten? Posted on May 20, 2012, in Uncategorized and tagged books, cheap books, children s books, classroom, garage sale, garage sales, gift, present, secret sisters, sidewalk chalk. Bookmark the permalink. 4 Comments. What a deal you got! It is true…one person’s junk is another person’s treasure. Those books look to be in GREAT shape! Congrats! Thanks, Gereta! I can’t wait to work with that wonderful teacher! I’m already getting really excited about next year 🙂 Someday I’ll have as many books as you do!